Race-ready right out of the box! For amazing response from an affordable production carburetor, your search stops here. Holley delivers with hard-core 4150 series carbs for serious high performance ranging from 390 to 1000 cfm. 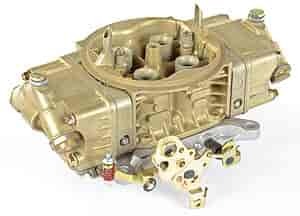 Most primary and secondary accelerator pumps are either both 30cc or both 50cc except for part numbers 510-0-80513-1 and 510-0-80514-1, which are a 30cc primary/50cc secondary combo. Spun-in boosters are straight leg, down leg, double-step down leg, or annular. Part numbers 510-0-80507-1, 510-0-80541-1, and 510-0-80509-1 are NASCAR-approved. 0-80514-1 is rated 5.0 out of 5 by 1. JEGS 50000 - Air Cleaner with Smooth Top 14 in. x 2 in. Holley 108-70 - Under-Carburetor Heat Shield Length: 13"